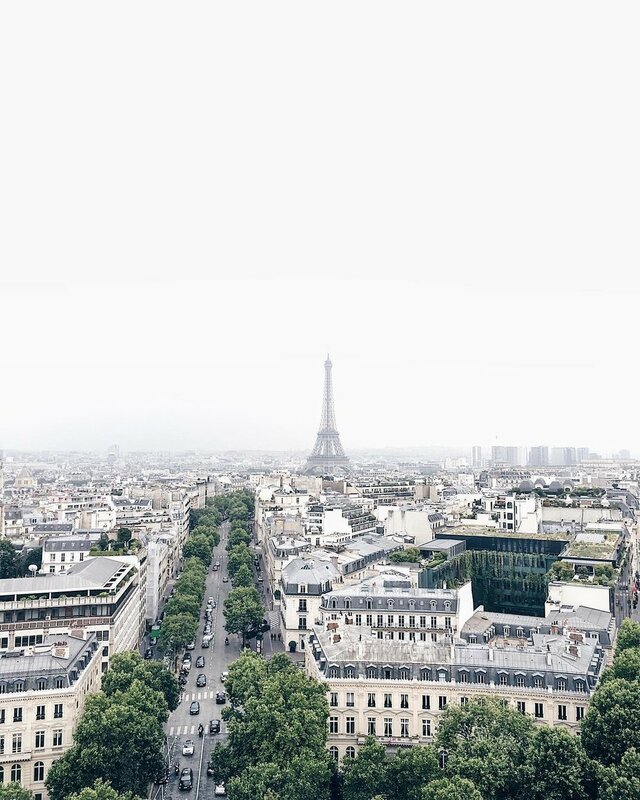 Even from afar, The Eiffel Tower oozes charm. 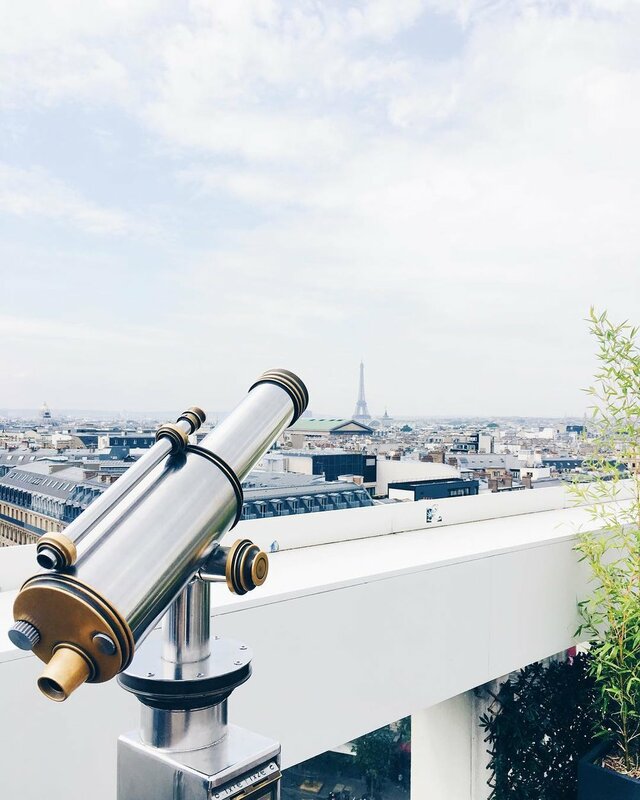 You can get this (free) view at the top of Galeries Lafayette, a high-end french department chain. This flagship store is on Boulevard Haussmann in the 9th arrondissement of Paris. The rooftop terrace, aptly named La Terrasse, is on the 7th floor of the building. Wish I had known this earlier, but that telescope is not a typical telescope. It's a virtual reality telescope that takes you back in time to Paris in 1912. Depending on the time of year, the Cube Bar is also set up to provide you with refreshments and tapas while you watch the sunset. While the view of the Eiffel Tower from Galeries Lafayette is free and a quick elevator ride up, the view from Arc de Triumphe is not. It is, however, a good cardio workout if you want this view. Unless you're handicapped, good luck on your way to the top. The stairs become narrower and steeper, but the view is worth it - right? The best time to go is around dusk. You'll get to see the tower in the daylight, during sunset and at night when it lights up and sparkles. Eat a baguette. Drink some wine. Nibble on cheese. 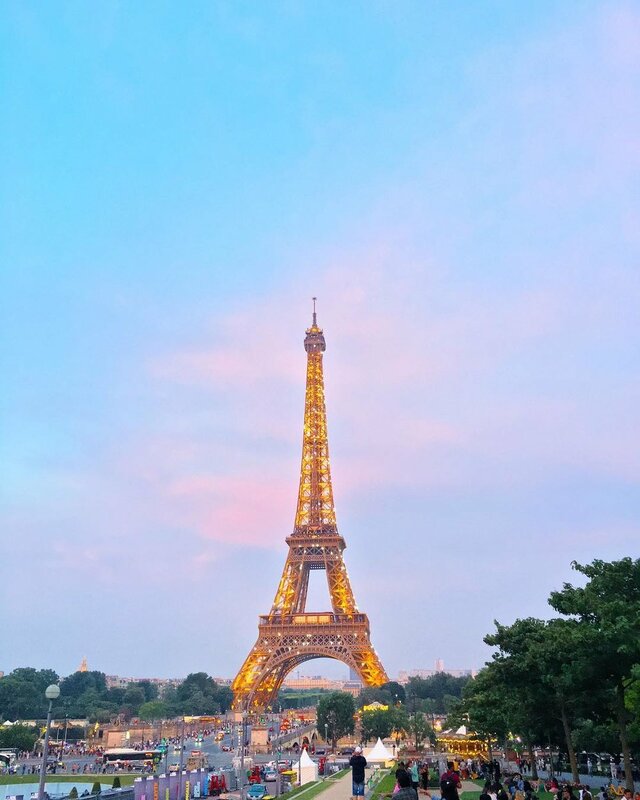 Trocadero is across the Seine River from the Eiffel Tower and offers another picturesque view of the Eiffel Tower. Once the locale for the World's Fair in 1867, it's now where everyone goes to take pictures of the tower. How can they not? Many tourists and locals pack a picnic and lay around all afternoon to watch the sunset and the tower glitter at night. During my 1.5 week in Paris, I visited The Louvre three times - one three different days. Unintentionally, of course. I had an entire day carved out just for this museum. The all-day trip included a visit to Angelina for brunch. I was looking forward to this the most. It's the only Angelina cafe that serves this decadent Pyramid-shaped dark chocolate and hazelnut mouse cake called Richelieu. Aptly named as the cafe is located in the Richelieu wing. Some may say it has the best view overlooking the Pyramid, but I enjoyed the balcony view more from the museum cafe. I was 99% here for that pastry. I made sure to see some art, too. 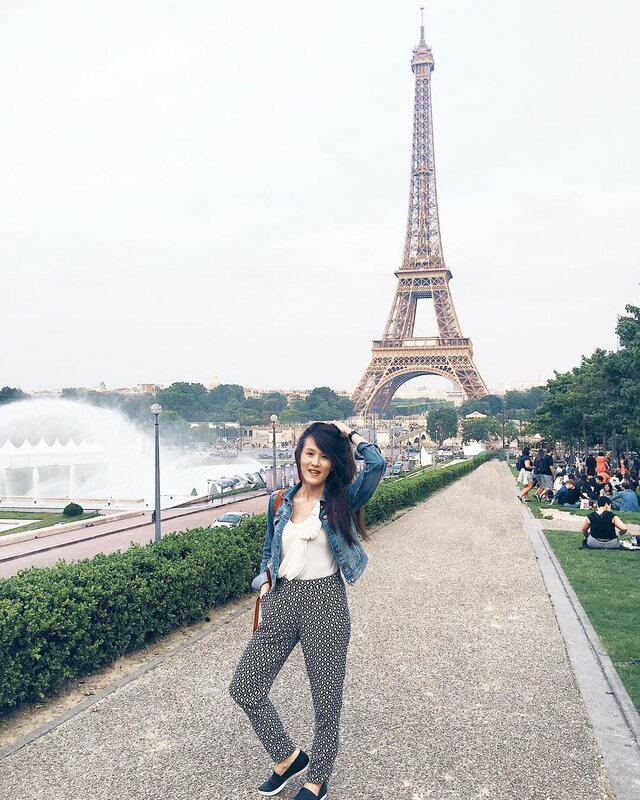 The first time I was at The Louvre was actually during my first day in Paris. I thought it would be a smart idea to see the Mona Lisa right before the museum closed. I figured there would be fewer visitors as most people would be winding down their visit. I was wrong. As I made my way to the room where the Mona Lisa hung, the smell of sweat grew stronger and stronger. The body odor that surrounded this pint-size painting was almost palpable. Like most tourists, I "politely" elbowed my way to the front of the crowd. Was it worth it? Meh. But at least I can say, I saw the Mona Lisa in real life. The best part of that visit was the evening view. Sunset at the Pyramid was the perfect way to end my first day in Paris. It was so good I came back a second evening! I saved the best for last - The Blue Lagoon. After these past few days of exploration, my muscles sorely needed a good soak in this geothermal spa. Regardless of what package you get, you definitely want to get your money's worth. I reserved my visit to The Blue Lagoon on my very last day in Iceland. It was the perfect way to end an adventurous trip. 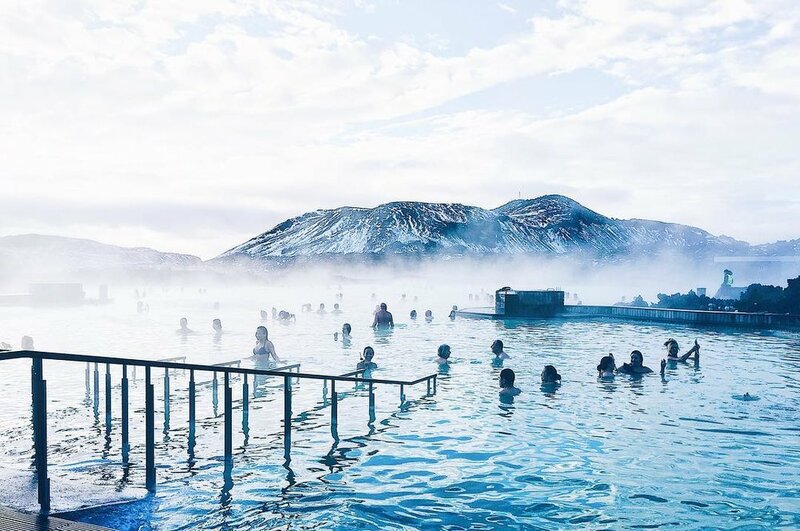 From Reykjavik, it's a 45-60 minute bus ride to The Blue Lagoon. Since I was flying out later that afternoon, I booked my reservation as early as possible - 8AM. If you're someone who needs to decompress after a flight, making The Blue Lagoon your first stop in Iceland instead of your last is also a great option. It's only 15-20 minutes away from Keflavik airport by bus. When I arrived to the lagoon's entrance, I was greeted by this heavenly view. If only every day could start like this. The queue to enter was short since it was the middle of winter and painfully cold at 7:45AM. I was assigned a locker, took a quick rinse and gingerly stepped outside in the blistering cold in my bikini. I wasted no time and made a bee line to the algae stand located off to the side of the main lagoon. Looking like Clayface, I hopped in and out of the water to stay warm as I attempted to explore the other parts of The Blue Lagoon. I had the place mostly to myself for about two hours before more visitors started arriving. As I watched the clock in the lagoon slow tick towards my departure time, I reluctantly hoisted myself out of the water and looked back at the view - a vibrant blue steaming spa surrounded by snow capped mountains. I wish I could have lingered, but when the temperature is single digit it's hard to hold out in a wet bikini. Thanks for the memories, Iceland.